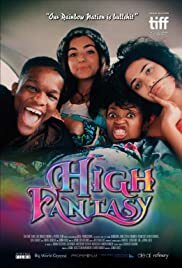 Four friends (1 male 3 females, two black and one white) on a camping trip at an isolated farm around Capetown, South Africa wake up to discover they’ve all swapped bodies. Four of the actors Qondiswa James, Liza Scholtz, Nala Khumalo, and Francesca Michel all wrote the script together. A mix of comedy and drama, the campers argue on issues like race, gender, inequality while spouting out foul language to no end. Shot on an iPhone, the film obviously has the feel of THE BLAIR WITCH PROJECT and TANGERINE. This is a personal film, as can be clearly observed, and therefore not for everyone. The filmmakers do not care for anything and just do their thing. Though occasionally funny, the whole exercise is a wast of time and talent (or rather, effort). The film only serves to prove that one should pick ones friends while going camping.